I picked up my two new Harbours's yesterday from Smokey at the shop. Wanted to publicly thank him for being such a good guy and taking care of me once again. The first board is a model called The Rapier. Had volan with a deck patch and tail wrap along with a white pin line on the deck. It is a dark blue with a green deck. The blue color is darker than in the pictures. I really liked the way it came out with the Sea Nymph logo on the deck and bottom and had an iron cross made on the bottom above the fin box with the small Harbour lams. The reason I post here is the honesty and the no Bullsh*&t that all of you have demonstrated in your thoughts. I consider this clan (read, Forum posters) as true soul surfers. My question to all of you is this; what best depicts your Forum Name? For me, Dawn Patrol, that's pretty straight forward. I get up at O'Dark thirty and get my 2-3 hours of waves to myself. When I come in, the sun is rising and I'm off to work. Understand, here in the PNW it gets light to see at 4am around May and although a challenge, there's still a lack of surfers. So give it up folks! Moonshadow, Log Donkey, Grush, Monkeyboy, Peakmaster, Crabcakes, etc. What is it with your post names that best depict you as surfers? Inquiring minds would luv to know (well, at least mine). What year did you start surfing? And what was your 1st board, and location for your 1st paddle? Some of you know that I have been battling with a kidney disease, IGA neuropathy, for the last 2 1/2 years and have been on dialysis, and in the last year or so I have not been feeling too great. My wife and I have been testing and working on a transplant called non-compatible blood transplant, where my wife would be the donor and I the recipient of her kidney. But last Friday morning, about 4:00 a.m., we got a phone call from the UC San Francisco kidney transplant division that a young man in New York had passed and when they ran tests on his kidney thru a central data base in Virginia, I came up as a zero rejection, perfect tissue and blood match, out of hundreds of thousands of people waiting for a transplant throughout the United Stated. This type of perfect match allowed me to have priority over everyone else in the database. One of his kidneys stayed in New York and the other one was put on a plane headed to San Francisco to me. After some bad weather, and flight delays, the kidney arrived late Saturday afternoon. They took me into surgery at 5:30 p.m. I was back in my room by 11:30 p.m. The kidney started working almost immediately, although I am very sore and in some pain and it will take some time to heal and a lot of rejection medications. The UCSF team of kidney surgeons told me that I had "won the lottery". The odds of being a perfect match were extremely low. It is very rare that a kidney is received from out of state, so this was truly a gift. Can't go by looks alone. 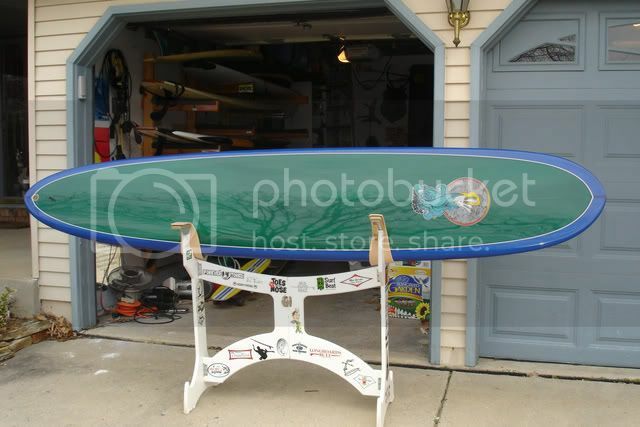 Anyone own or ever ridden a Orange Surfboard, just curious about them. Where are they from,who shapes for them,etc. ? Check this link out...Wingnut takes his Surftech love affair to new heights... I think he's referring to real longboards made of real materials! I typically use my noserider more than any other board I have, but I curious as to what others use when conditions aren't built for a heavy single fin? Just window shopping for something smaller. I sure hope that they don't make their surfboards in the same factory as the "flip flops"
ps. Be sure to arrow down to check out the damage.